1Jeep safaris are by far the most common. These safaris can be groups of 5 to 15 using 1 to 3 jeeps. Most jeeps have viewing from sides or top. Some are fully open on sides while others are similar to the one shown. Pictured above is a safari in Tarangare region of Tanzania. 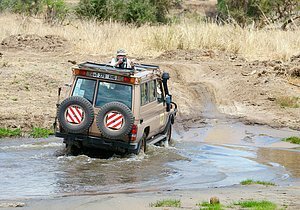 In general jeep safaris are the most common. Smaller, regional aircraft are great for quick travel between areas or countries often saving valuable time. The scenery is usually spectacular when viewed from above. One concern however is weight limitations that are often necessary for such small aircraft. 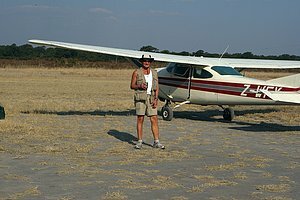 Pictured above is a landing strip in western Botswana. 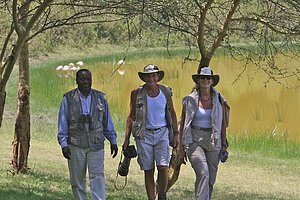 3Walking safaris are also available. in some areas. These must be in the accompaniment of an experience guide. Generally walking safaris are not allowed in areas known to have lions. Pictured above is hiking safari in central Kenya with our guide Mungai of Ontdek Kenya. 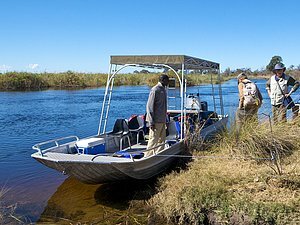 4Boating safaris are commonly offered in wet land area such Eastern Namibia or on rivers in Botswana. Here we are boarding a boat for a safari along the wet lands of Caprivi Namibia. Hippos and crocks as well as numerous water birds are common sites. 5In some areas helicopters are used to get around. 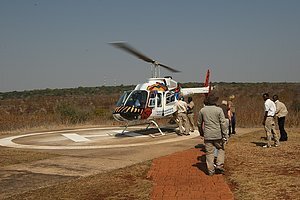 Here we are barding a chopper to view the Victoria Falls from above. This is located in Zimbabwe. Even a Hot air balloon! 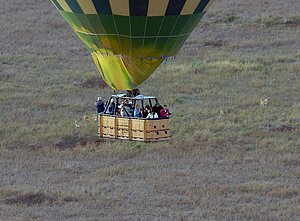 Occasionally hot air balloon rides are offered. Here we are veiwing the Serengeti shortly after sunrise. Above, note the numerous lions on the ground. This was an great treat and we were given a traditional champaign breakfast at landing! Spectacular photos can be captured this way. The Serengeti is located in Tanzania.